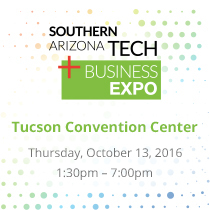 The Arizona Technology Council (AZTC) and the Arizona Commerce Authority (ACA) are presenting the fourth annual Southern Arizona Tech + Business Expo on Thursday, October 13, 2016 at the Tucson Convention Center. This is Southern Arizona’s largest technology event of the year and includes panels, speakers as well as a giant technology expo. Why should you plan on attending this early? AZTC has put together the top three reason to attend the 2016 Expo: make sure you take advantage of our Early Bird Registration Price and register today! 1. Connect and Network. Generate qualified leads for sales growth and connect with new customers. 2. Powerhouse Keynote Speaker. Learn from a local CEO, Ryan George, about building a successful and thriving global company. 3. Company Technology Innovator Presentations. Promote the success of your company innovation and connect with 350+ attendees. Register today before the Early Bird Registration Price expires on Friday, August 26. Tell us about YOUR business. For the first time, AZTC is pleased to offer Company Technology Innovator Presentations on the main Expo stage. This is your opportunity to have dedicated time to promote your business, service or products. Presentations will be limited to 10 minutes and there are a limited number available. Interested in more information? Email Tracy Sole de Hoop at tdehoop@aztechcouncil.org.